Vincent Price is your sinister host for the Zounds, Alack, and By My Troth Halloween special, inspired by this classic movie trailer. Why Vincent Price? Because of his finest hour, the movie that gave this cartoon its title. 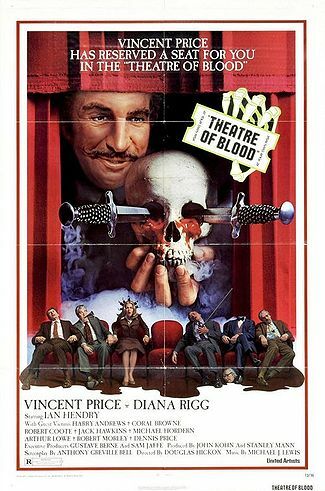 1973 comic horror Theatre of Blood stars Price as Shakespearean actor Edward Lionheart, who fakes his own death, then returns to murder the critics who had the audacity to give him bad reviews – but the theatrical twist on his revenge is that payback comes in the form of elaborate recreations of Shakespeare’s most famous death scenes. Perhaps the most pointed moment comes when Harry Andrews’ lecherous hack Trevor Dickman is invited to appear on stage in an amateur production of The Merchant of Venice (“We’ve made several slight alterations in the text, and one rather large cut.”), only to forget all his cues and deliver every line in the same booming, self-satisfied monotone, until Lionheart goes one better than Shylock by actually getting his pound of flesh. (“Only Lionheart would have the temerity to rewrite Shakespeare.”) The film nevertheless guards itself against accusations of bitterness by making a critic the hero – Ian Hendry’s Devlin, whose bad notices stem from a desire for theatre to be as good as it can be, and who chastises Lionheart, not unfairly, for stagnating as an artist. But this is Price’s show, and he is magnificent, his trademarked sardonic villainy lined with an undercurrent of wounded pride, and getting a rare chance to deliver choice cuts of Shakespeare with aplomb. Diana Rigg gives the film its heart as Lionheart’s devoted daughter, playing a tragic Cordelia to Price’s Lear, while also gamely spending much of the film in male drag, complete with droopy moustache, footballer’s perm wig and thick Brummie accent. It’s inevitably dated (it wouldn’t be early Seventies pop culture if modern sensibilities didn’t have cause to feel awkward at least once…) but the mix of gruesome horror and witty dark comedy is still devilishly good fun, and thoroughly recommended if you’re in the mood for some Halloween viewing with a Shakespearean theme.